Former Bar & Restaurant owner, Raymond Haldeman parlayed his life-long restaurant experience into a successful Restaurant Contractor & Design Business dedicated to assisting independent operators design, build & launch their restaurants. (Click here to see Raymond Haldeman’s Restaurant Designs.) If you are close to planning your renovation or new-build and not sure where to begin, start by calling Raymond Haldeman who offers all prospective clients a free phone consolation that will answer your questions, give you candid and realistic advice on costs and options and provide a professional perspective on your project. Although Haldeman's successful track record has been extensively documented in high=profile publications like the NY Times, Hospitality Design and Money Magazine, he wants you to know that as a former owner/operator he understands what's its like to pay the bills every month and is keenly aware of that when designing your restaurant to function efficiently, maximize revenue and impress your clientele. His former clients welcome your call and are eager to recommend his Restaurant Contractor & Design Services. Raymond's knowledge base is extensive and in addition to working with you to develop a design concept, his services will also provide you with a team of contractors and craftsmen to build-out your space. He will assist you in prioritizing your expenditures and advise you on acGrand Opening and Marketing strategy to insure a successful launch of your new venture. Call for a free and confidential consultation. Speak directly to Raymond about your plans and share your concerns. Feel free to ask questions about things that you are not quite sure of. You'd be surprised how much clarity you can get in one phone conversation. CALL NOW you have nothing to lose! 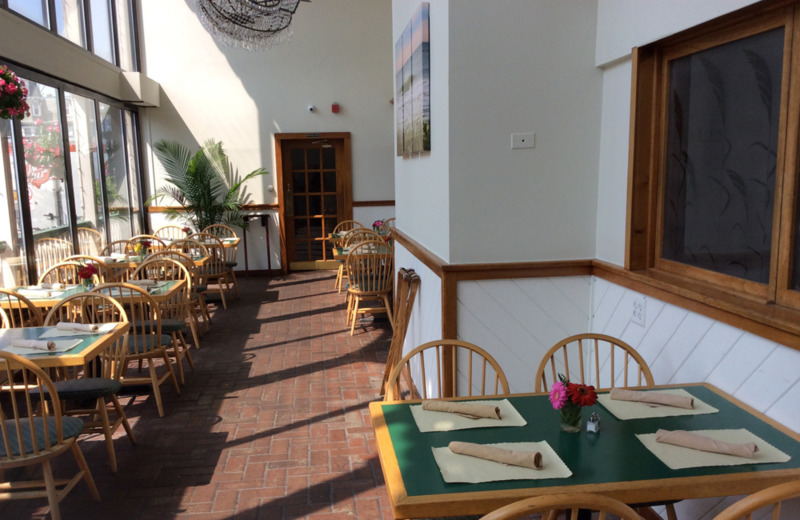 Raymond Haldeman in Fins, Cape May, NJ enjoying his restaurant design. NEW YORK - Former restaurateur & nightclub owner turned Restaurant Renovator & Designer, Raymond Haldeman who’s exploits in the industry have been well publicized in such notable publications as Gourmet Magazine, Hospitality Design, Bon Apetit, The NY Times and Town & Country, says the question of whether to Renovate & Rebrand has dogged many a bar, restaurant and nightclub owner. Although many are employing this increasingly popular trend very little has been written about it the essentials. As with hospitality operations, rebranding is a comprehensive endeavor and owners must be honest with themselves when they assess their shortfalls and address the right strategy for meeting their businesses needs. A cosmetic renovation will not change or improve your image if the the food and service still lack consistency. However, a designer-rebrand when combined a professional restaurant renovation, improved operational function, the right menu, a price point that services your locations demographics and an upgrade to the servers' knowledge & bartenders'attitude can provide an immediate “about-face” for any operation experiencing declining sales & waining popularity. Yes, a Rebrand can, IN ONE DAY, provide you with a new start. In one day, sarcastic Yelp reviews will disappear forever, in one day, cold food, bad meals and long waits experienced by customers are forgotten. In one day, a "tired" reputation can be replace with an invigorating buzz. In one day you have an opportunity to mold and craft public perception anew. This opportunity when approached comprehensively can put any bar or restaurant back on the road to profitability and give weary operators a reason to be excited and optimistic about the future of their establishments once again. If you plan on using a designer for your restaurant renovation, please be aware that most interior designers, without having experienced the actual management of “day to day bar & restaurant operations” unwittingly sacrifice function for visually appealing design. This shortfall can be costly to you, the operator as it can detract from the efficiency of your operation and marginalize the efforts by your professional staff to provide the ultimate dining experience for your customers. It is critical that you align yourself with a professional who is intimately familiar with running a bar, restaurant or nightclub. Rebranding does cost money as it is important when renovation that you remove any trace of your previous operation so your patrons experience your reinvented eatery as new, valuable and exciting. By the same token, it is still the best option available and also a bargain when you consider you are able to create a new income stream under your current "existing" overhead. Remember you are not starting from zero, your lease is in place, the infrastructure exits, the kitchen is operating, the bathroom plumbing was run when you built the place, the zoning is there, you are intimately familiar with the market. Now you can start developing a concept by carefully and thoughtfully applying all your wisdom into your rebrand and get it right the “second time” by addressing all that you now know needs fixing during your restaurant renovations. Make a plan, schedule time for the construction and get started. The following is outline of a recent Rebrand by my company Raymond Haldeman, INC., a Bar & Restaurant Renovaton and Design Consulting Firm. Call Now for Free Phone Consultation! Operated as the former Pilot House for over 3 decades, the restaurant was purchased by a group headed by Jeff Gernitis who kept the bar & restaurant operating for several months while formulating a rebrand plan. During this time Jeff and his partners set about familiarizing themselves with the nuances of the location on Washington Street Mall a pedestrian promenade of shops and restaurants, about a mile away from the oceanfront front site of the iconic Peter Shields Inn & Restaurant which they also own. Haldeman decided to exploit the city’s excellent reputation as a tourist destination by creating a beautiful and unique concept that would also propel the restaurant into the town's “Top Must-See Tourist Attractions List”. He also reconfigure to the space to put the emphasis on the bar. If an hour and half wait for a table at 7PM on a Wednesday evening and a bar packed with patrons until 2AM is any indication, this goal was most certainly accomplished in short order. Ultimately Haldeman went with a Casual & Contemporary Aquatic Theme using 700 linear feet of soft, dramatic and glowing LED lighting, detailed architectural craftsmanship and quality finishes and a 60' walk-around custom poured ocean glass bar-top. *SCROLL DOWN TO SEE WHAT HE DID! All good restaurant rebrands begin with a "good plan" that should remain fluid during the conceptual process. Below is version #19 of the FINS FLOOR PLAN, indicating the plan evolved through 19 revisions after it was approved! FREE PHONE CONSULTATION - GET YOUR QUESTION ANSWERED!